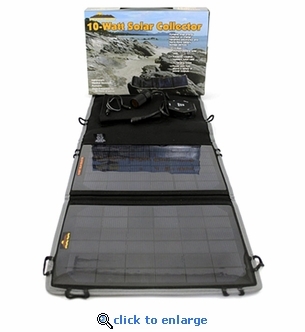 The Sierra Wave 10-Watt Solar Collector is easy to take anywhere and to generate solar energy for a variety of electronic devices. This foldable weatherproof solar unit comes with a multi voltage power port hub that allows for 5V USB, 6V, and 15V power output options. Two of these portable solar collectors can be daisy chained together to increase energy collection. 10 Watt Monocrystalline Solar Cells. Foldable, weather resistance nylon case with handle. Power port hub allows a variety of power outputs. Chain together 2 for 20 Watts of Power. 5V USB,5V,9V,12V,16V,19V and 21V - Voltage selections. 12v adaptor for car lighter, cable to connect 2 Solar Connectors. 1 year manufacturers warranty on material and workmanship.